The Miao are one of the most ancient of China's nationalities, tracing their origins back more than 4,000 years. Prior to modernization of farming methods, they grew millet and buckwheat using the slash-and-burn methods. The Miao language has three main dialects, but there was no unified written script until 1956. Religions include nature and ancestor worship and Christianity. Dispersed from southern China across northern Vietnam, Laos, and into Thailand, the Miao, vary in dialect, styles of farming, and designation: Black, White, Red, blue, Flowery, and Cowrie Shell Miao among others. Forced southward by the Han, often despised and exploited, many settled in distant mountains, raising millet and buckwheat by slash-and-burn farming, their diet supplemented by domestic animals and hunting. Modernization, improved farming methods, organization of communes, and road building has been made difficult by the ragged terrain in which the Miao are scattered. The Miao are found in the Guizhou, Hainan, Hubei, Sichuan, Gansu, Guizhou, Qinghai, Hunan, Guangdong, and Yunnan Provinces and the Guangxi Autonomous Region. They are part of the Hmong-Yao language family linguistic group. About 195 km almost directly east of Guiyang in the town of Kaili. Kaili is a fairly uninspiring place but the area is host to a large number of minority festivals, over 130 annually. One of the largest is the Lusheng Festival, held from the 11th to the 18th of the first lunar month. 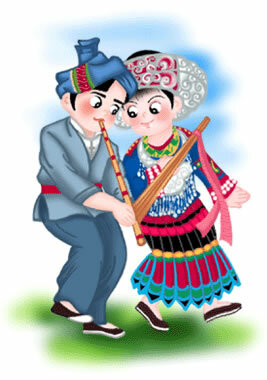 The lusheng is a reed instrument used by the Miao people. Activities include playing the lusheng, dancing, drumming, bull fighting, and horse racing. Participants are said to number 30,000. The festival is held in Danxi. Other festivals are held midway in the 7th lunar month and in their New Year. Their New Year is celebrated in the first four days of the 10th lunar month by some 50,000 people.